Our desilter is designed and manufactured for the third phase purification of drilling liquid. It is used to remove solid particles ranging from 15 to 47 microns, which consist of over 60% of the total solid content. The solid content in fluids can be controlled below 0.15% using our desilter. 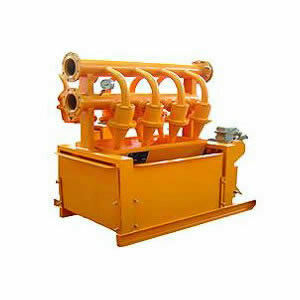 If you are looking for any oil drilling equipment, our products will be your ideal choice. As a China desilter manufacturer, we provide a variety of products to meet your different needs. Our primary products include well cement tools, solid control equipment, workover tools, and more. Featuring high performance, reliable quality and great durability, our oil drilling equipment is sought after by customers in Brazil, Russia, Singapore, Egypt, America, among others. Don't hesitate, please contact us today for more information on our products.